We refer to our Lightweight granite and other natural stone panels as a ‘problem solver’. Generally as stone increases in size then the thickness increases also adding to both weight and adding costs to the installation. The cheapest form of natural stone are tiles, which we do not supply, are readily available in 305 x 305, 450 x 450 & 600 x 600mm sizes varying (depending on material selection) between 10-15mm in thickness. If larger sizes are required then the thickness increases to between 20-30mm and then mechanical fixings may be required if the materials are to be used for walling applications and this can be very expensive. Our lightweight granite and other natural stone panels weigh only 16 kg/m2 irrespective of material selection and are usually fixed with adhesive and can be applied to any solid surface irrespective of panel sizes. Our standard materials are available as either full size sheets approximately 2400 x 1200mm or as cut-to-size ready to install products. 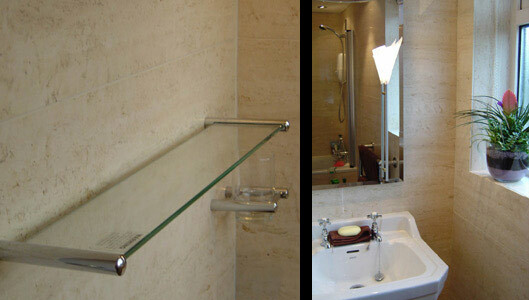 Old 305 x 305 ceramic tiles needed updating to create a fresh modern but minimalistic look. One solution could have been to remove the existing tiles, making good any damage and replacing them with new tiling. The solution chosen was to simply over clad the existing tiles with our 7mm reinforced Travertine panels in modules of 420 x 720 & 420 x 1600mm. There were no removal and making good costs to consider and the installation took less time than it would have to have installed new tiling. 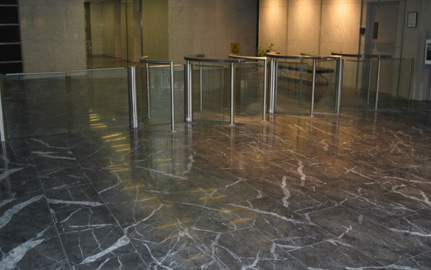 Solid 20mm marble tiles needed a makeover as they had become worn, cracked and scratched from years of use and they were beyond repair. One solution could have been to remove them by hand and to then re screed the floor and install new materials. The solution chosen was to lay our 7mm reinforced marble tiles directly over the exiting flooring saving both considerable time and money for the owner of this Central London office block. 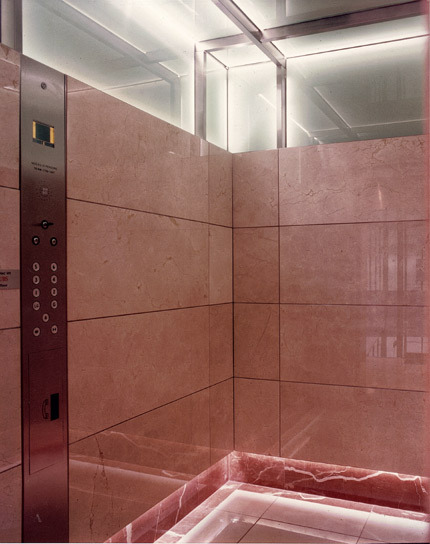 Lightweight honeycomb backed stone used to upgrade lift car interiors on central London office project.